The Metropolitan Water Reclamation District of Greater Chicago (MWRD) – of which the Terrence J. O’Brien Water Reclamation Plant (WRP) is part of – has made a number of upgrades to its treatment process in recent years. 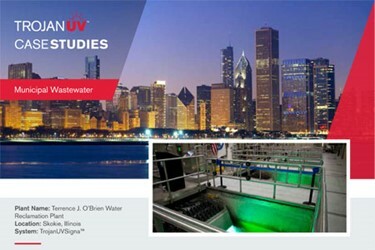 The addition of UV disinfection has been a critical part of these upgrades; it played a key role in improving water quality throughout the Chicago Area Waterway System (CAWS). After investigating various disinfection approaches and technologies, officials determined that UV was the optimal solution for the plant and application. A low total cost of ownership and the fact that, with UV, there are no disinfection by- products to worry about were key factors in the decision. In 2013, the MWRD announced that they had selected the TrojanUVSigna™ for installation at the Terrence J. O’Brien WRP.